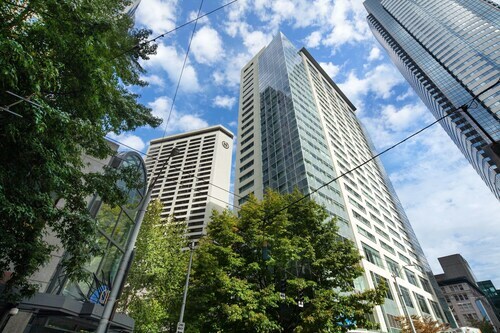 Location is perfect for being downtown! Lots of restaurants and shopping nearby. Nicely decorated bright great location with easy access. I know they were doing improvements/additions, but outside our window, before 7am, they were making a LOT of noise with machines and such. Great centralized place to stay. It appears to have been recently renovated. Comfy beds. Good water pressure. Very helpful staff. The parking lot is small and compact. But everything else was good. It would be nice to have a overhead light in the room and not just lamps on the tables. This a trip back in time to a comfortable 2 story property in a convenient location. Weekday rates are very reasonable and the mattress in my unit was very comfortable. I would recommend this hotel. Tucked into the northwest corner of the United States, the Emerald City is a beautiful community on the coast situated between Puget Sound and Lake Washington. Seattle is home to a popular music scene that predates the age of grunge and Nirvana, and several venues for the visual and performing arts are conveniently located within walking distance of many renowned hotels. The locals are also passionate supporters of Seattle's sports teams, and it's easy to get caught up in their enthusiasm. The great outdoors is never far away during a stay in the city, and trails include the 27-mile Burke-Gilman route, which takes adventurers through the grounds at the University of Washingtonone of the oldest educational institutions in this part of the worldas well as offering views across the water. Discovery Park, set in the Magnolia district, provides a fun hike and picturesque beach for families to explore. Many of Seattle's impressive attractions are located in or near downtown. The home of the 1962 World's Fair is where the Space Needle, the landmark feature of that event and the symbol of Seattle, sits. Once completed, this 605-foot structure was the tallest west of the Mississippi River. Many hungry visitors now dine inside the restaurant here, the second revolving one in the world. Also in Seattle Center are Key Arena, the city's primary indoor entertainment center, and the EMP Museum, which is home to an impressive display of popular culture, including science-fiction and musical memorabilia. Visitors looking for an oasis in the city should try the Chihuly Garden and Glass center, where colorful, delicate sculptures adorn the outdoor space. This neighborhood, which received its name due to its location directly south of downtown, is home to the city's major sports facilities. The NFL's Seahawks and the Sounders of MLS play at CenturyLink Field; both are known as having the loudest fans in their respective leagues. Meanwhile, MLB's Seattle Mariners play at beautiful Safeco Field, a complex with a retractable roof that protects players and fans from the rain. Flying fish, vibrant flowers, delicious food and unique handmade items are all staples of Pike Place Market. Coffee lovers can stroll just across the street to reach the first-ever Starbucks café, where the smell of roasted beans permeates the air and traditional hardwoods create a welcoming atmosphere for those looking to escape the rain. This citywide celebration is a perfect event for those visiting Seattle in June, July or August. Among Seafair's highlights are the Torchlight Parade, which goes through downtown, performances by the Blue Angels over the city, and the Seafair Cup hydroplane races on Lake Washington. Music lovers will want to make sure that they travel to Seattle Center during Labor Day weekend for this event. The international music and arts festival regularly plays host to talented musicians such as Elvis Costello, Death Cab for Cutie and Heart. This quirky celebration is self-described as “a free spirited solstice weekend,” and it celebrates the “delibertas quirkas” (freedom to be peculiar) culture. It is perhaps best known for the artistic Solstice Parade, which occurs on the Saturday closest to the summer solstice. Cyclists, many clad only in body paint, traverse the route immediately prior to the parade. Locals don't want the secret to get out, but summers here are gorgeous. The average day in July has nearly six times as many sunny hours as one in December. Just four percent of the city's annual precipitation occurs in July and August combined. Conversely, if your visit is during the winter months, you should expect the cloudy, grey weather that Seattle is celebrated for. Travelers will find plenty to love about this Jet City. Pet friendly. Potty area. Remote could use new batteries. Location is excellent closed to shopping, dining and theaters. Very clean and location is excellent closed to restaurants, theaters and department stores. Very friendly and helpful staff.